Bills head coach Doug Marrone was asked about the team’s Monday release of WR Da’Rick Rogers and he made things plain. “He definitely has skill, along with DeMarco Sampson who has played well for us in the preseason,” said Marrone of the two receivers that were moved off the roster. “But I think when you look at the production of that group and who has produced for a long period of time, it’s just as simple as we feel we have better players on the roster right now than the players we released. That’s what I communicated to them. Marrone also explained that he’s interested in keeping players that can help this team right away not down the line. There were a number of quality individual performances in Buffalo’s first preseason game that made the highlight reel, but there were some that flew under the radar Sunday. Here’s a look at some of the better play turned in by some players you might not have noticed watching the game live. Crezdon Butler – The cornerback was noticed on his second quarter interception off a tipped pass by Manny Lawson that led to a Bills field goal, but Butler had two other pass breakups in the game to lead the team with three. Those other two both came on third downs. One was on a 3rd-and-6 play at the Bills 26, which forced the Colts to settle for a FG. The other was on a 3rd-and-5 at the Colts 13, which forced a punt. He also had a third down tackle on a 3rd-and-2 bringing down Nate Palmer for no gain to force another punt. A really nice effort for the corner that’s been running with the second unit. Jarron Gilbert – The reserve defensive lineman wasn’t dominant, but turned in a few plays that helped the defense get off the field. He had a quarterback pressure on a 3rd-and-5 that led to a Colts punt. Gilbert also had a tackle for loss on a pass to Colts back Kerwynn Williams out of the backfield dropping him for a loss of two. He had a pass breakup to his credit too. 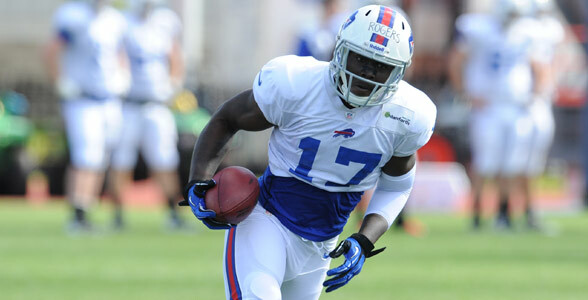 Shawn Powell – Powell, who was coming off his best practice of camp, punted very well Sunday. He only kicked twice, but boomed a 55-yarder to the Indianapolis 15. Accomplished return man T.Y. Hilton unfortunately had a 15-yard return on the play. His other punt from his own 28 he launched out of bounds at the Colts 26 on a 46-yard effort. His best work however, may have come on his holds as he had to reach outside his body frame to get a couple of field goal snaps down in time for the kick attempts. Nickell Robey – Robey had just a couple of tackles on defense holding receivers short of moving the sticks on both, but more importantly he proved himself capable as a punt returner. He looked elusive on his three return attempts. He had a long of just 14 yards, but he averaged 11.7 yards a return and made coverage players miss. Anytime a punter can average better than a first down (10 yards) you’re considered very productive. DeMarco Sampson – Sampson got 28 snaps, but only 15 were pass plays. He had four receptions for 49 yards late in the game. Three of his catches went for first downs. He also drew a pass interference penalty that gave the Bills a first down on a third-quarter TD drive. Newly signed WR DeMarco Sampson is a former seventh-round pick of the Cardinals (2011), but there’s more to know about him than that. He’s already spent time with two NFL clubs, Arizona and Philadelphia. Sampson has appeared in 12 NFL games in his career, all with the Cardinals in 2011. He has three career receptions and two of them came from the arm of Kevin Kolb in a loss to Pittsburgh during that 2011 season. Here’s the scouting report on Sampson from 2011 when he was in attendance at the NFL Combine.